Danny is getting on quite well with Nick, but Shane hates him. Paul tells Julie that they're not kids anymore and he has the right to live his life how he chooses. Danny goes to see Max at his bedsit. He asks Max if he and Maria split up because of him. Max looks a bit takenaback for an instant, but then says no. Danny says that he's caused a lot of trouble with Shane's accident and him running away. Danny wonders if Max and Maria fought about him running away. Danny says all he is to Max is trouble. DANNY: Bet you wish I'd never been born. Max says that all families have their ups and downs. 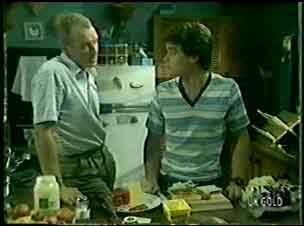 He tells Danny that he and Maria don't have a perfect marriage. At the moment they've got a few problems to work out. Danny asks if Max will ever come home. Max doesn't know. DANNY: Whatever it is, can't be that bad! Max tells Danny that he and Maria have to decide that for themselves. He tells Danny to go home - Maria will be worried about him. Before he goes, Danny tells Max that this is the first decent talk they've ever had. Max admits that he's right. He shows Danny out. Jim and Nick are chatting amiably when Paul, Julie and Helen come in with some shopping. Paul asks Nick quietly if there's any news on the job front. Nick says that hundreds of people do apply every year, but Paul is optimistic because he has Nick to put in a good word for him. Nick says he's putting some feelers out. In the kitchen, Jim tells Helen that he's made it up with Nick. Also that Nick is very lonely. It's quite sad really. Jim says that he hates the thought of Paul losing touch. Helen says there's no way Paul will end up like Nick. Jim says they'll have to find that out the hard way. Maria is doing some paperwork when Danny comes in. She tells him off for not telling her where he was going. Maria is mad with Shane for not doing the lawns. She says Nick has offered to do it. Shane is not pleased at this, but Maria says that if Shane continues to be lazy, she has no choice but to take up kind offers. Shane tells Maria angrily that he's going to get a place with Max. Max comes in through the back door. Maria is still upset about the row with Shane and Max asks her what's happened. Maria is mad that Shane is going to live with Max. Max says that nothing was set in stone. Maria says she's not coping very well on her own and Shane isn't helping her very much. Max tells Maria not to take things out on Shane. 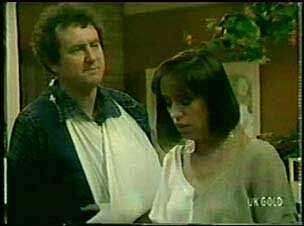 He apologises for this and tells Maria that Danny came to see him. Max says that of course he didn't tell Danny the truth. He picks up his messages from beside the telephone, but there's no telephone number with the message, just an address. MARIA: Look, if you don't like the service, find someone else! 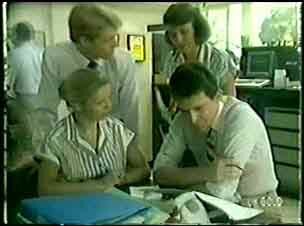 Des is going over something with Marilyn when Greg comes up with a load of paperwork for Des. He makes remarks about Daphne and Des tells him to rack off. Marilyn thinks that Des should fight the decision for the Canberra job, but Des says there's nothing he can do but keep his eyes open for another job. Maria is sitting in the lounge crying a bit. Helen comes in through the back door and finds her there. Maria explains that she and Max had another row, even though she really needed to talk to him. Also, Shane wants to move out and Danny thinks everything is his fault. Maria wishes she had told Max about Danny's paternity years ago. Helen says that she can only go on from where she is now. Maria has to face life on her own. Helen does understand - she felt the same when Bill died and you just have to get on with it. Maria doesn't want to give up on Max. Helen says she doesn't have to, but she does have to stop agonising about her life. Maria agrees to come into town with Helen and have lunch. Aww they are lovely friends. Paul is ringing the airline about his job, saying that Nick Berman has suggested him. They invite Paul to fill in an application form, but he's still up against stiff competition and it could be months before he hears back. Paul is disappointed. Greg takes on a job. Des tells him to get it right this time. Julie is still sticking up for Greg and Marilyn tells her off. Marilyn thinks Des has been treated unfairly by the bank over Daphne. MARILYN: Anyway, they're only sharing. JULIE: Yes. But we don't know *what* they're sharing! Marilyn tells Julie that she's jealous of Daphne. She insists she isn't though. Marilyn tells Julie to stop being blind - Greg has been getting Julie to do all his work. Marilyn says that Greg is using Julie, but Julie won't have this. Silly cow! Nick drives up. He's come to mow Maria's lawn. Paul comes up and tells him that he's spoken to the airline, and it could take months even to get an interview. Paul was hoping it would be quicker. Nick says maybe he hasn't got quite the influence with the airline that he thought. Shane comes in, upset that Nick has come round again. Danny says he quite likes Nick. Shane says that Nick is trying to move in on Maria - he's seen the way that Nick looks at her. Something might happen. Danny says that Shane is paranoid - Nick is nice to Danny. Shane isn't convinced, saying that Maria is very vulnerable at the moment. Danny says that Maria can take care of herself. Shane says he won't let Nick take Max's place in the household. Nick is having a drink in the kitchen before he starts mowing the lawn. 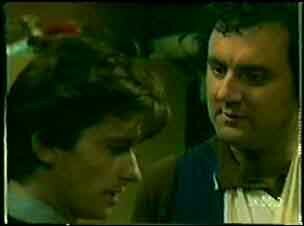 Shane tells him off for hanging around Maria. Nick says that Maria needs the company. Nick says he won't go until Maria tells him to. Shane goes to hit him, but Nick tells Shane to grow up. Maria has bought a new dress and Nick admires it. She invites him to stay for dinner, but Nick says he'd better go. He admits that he's had a row with Shane and it would be diplomatic if he made himself scarce tonight. Nick says he can see Shane's point of view - trying to protect Maria. But Maria has had enough of Shane's bad manners. Des isn't pleased that Greg has given him the blame for the credit analysis mistake. He hits Greg and he falls to the ground. Julie and Marilyn come out of the bank as Greg hits Des back! He falls on his nose and lies there groaning. Maria is sewing when Shane comes in. She tells him that she's not happy with him for arguing with Nick. She wants Shane to explain. Shane says he tried to hit Nick - he thinks he's using Maria. Maria says Shane has no consideration for her feelings. Shane says maybe he should move out after all. Maria says Shane only does what he wants to. Shane still thinks that Nick is trying to crack on to Maria. SHANE: Did you have an affair with him that time that you left Dad?